Today social networking sites make billions of dollars from users’ activity and content merely by showing ads to them, while users don’t get anything in return. All the profit is taken by corporations and none of them tend to share it with their users. But the world is changing fast. Allabout.me is a new generation social network based on an advanced principle of fairness and transparency between the social media and a user. It combines the benefits of the digital currency of the future, the Bitcoin, and blockchain technology and gives its users an opportunity to get rewarded for using the service. Aside from standard SNS features, every Allabout.me user’s account can be used as their ad space, therefore all their followers become each user’s own advertising audience. Thus, by activating their advertising account in one click, a user allows their account to automatically post ads that will appear in all of their followers’ news feeds, and gets rewarded by Allabout.me for every ad display. The reward can be up to 50% of the ad cost per view. The important thing is that the social media does not reward users with its own money, but shares a part of the client’s payment. And this truly revolutionary approach of Allabout.me’s developers is unparalleled in the world. It is also important to mention that all the processes are fully automated and require no further action from the user. Our business model is a total win-win. Every user gets rewarded simply by spending time on the social media. So, it is not hard to imagine how many people would jump at the opportunity to effortlessly build a source of passive income. Our clients get a big, easily targeted and inherently ad-friendly audience, which is financially motivated in placing ads on their social media. Meanwhile, the social network provides itself with a constant inflow of new users and clients, thus increasing not only its profit, but also its popularity. The only question is: how is it technically possible to perform millions of transactions for millions of users at a time? The answer to this question lies in innovative Blockchain technology. Implementing our business model without its opportunities would be nearly impossible. Allabout.me will also use Bitcoin for external payments, particularly for transactions between the social network and the client. This is another unique feature of the project, unrivaled throughout the world. All the internal payments, user rewards and other transactions within Allabout.me will be carried out with the use of ME Token, the network’s digital token. 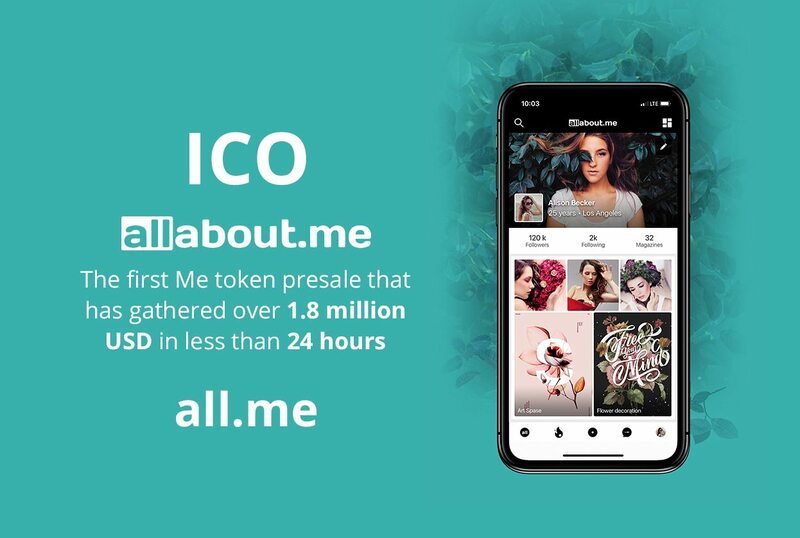 Allabout.me provides users with ample opportunity to use the token: purchase of stickers, gifts and profile themes, premium subscription, music subscription, Bitcoin exchange and — coming soon — the “Showcase” platform. It is a unique trading platform within the social network, where users will be able to purchase goods not only from trading companies, but also from each other. One doesn’t have to be a financial analyst to see the economic potential of “Showcase”. In the long term, it can even challenge the e-commerce companies dominating the global market today. It is worth mentioning that, aside from a wide range of uses within Allabout.me, ME Tokens can be used outside the network, too. Each user will have a cryptocurrency wallet and an exchange service integrated into their account, so that they will be able to send remittances to each other, exchange ME Tokens to Bitcoins or sell them at the Exchange. The innovative social network Allabout.me is now fully completed and ready for use, and anyone can already reach the future — in every sense of the word. All they have to do is tap the download button in the App Store or Google Play. The owners of Allabout.me are currently preparing for implementing an ICO in just a few weeks. Now Allabout.me is launching ICO. The project meets the highest expectations: ALL.ME tokens pre sale has gathered more than 1.8 million US dollars for less than 24 hours! The important thing is that the main aim of the initial coin offering is considered to be our business model expansion to all the regions and the continents of the world. And it’s perfectly reasonable, because Allabout.me is a truly unique, breakthrough project that opens a new chapter in social network development. This is the platform whose development is absolutely natural. This is the social network anticipated and deserved by every person from all over the world using a social network service. And while back in the day one couldn’t but bitterly agree that spending time on social media is a pleasure, but a total waste of time, now it is safe to say that every minute spent on Allabout.me has a real value and can give each user not only pleasure but also real profit. And all this is possible thanks to Allabout.me — the future that has already happened.